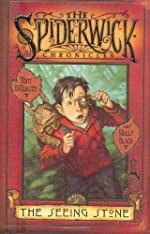 Review: The Seeing Stone is the second out of five books in The Spiderwick Chronicles. As the sequel to The Field Guide, Holly Black and Tony DiTerlizzi have written another book that will keep you reading until dawn! As the Grace Family settles in their new house, Jared and Simon, the boys of the family, start to experience the strangest events. Mallory, Jared and Simon’s sister, also begins to notice bizarre signs in their Aunt Lucinda’s house. After the first few weeks in their house, the Grace family starts to feel at home, until the Grace Kids, Jared, Simon, and Mallory begin to see strange footprints around the house, telling them they are not alone. They notice the smallest changes when they return home after going out. The strange creatures show themselves when Jared reveals the Field Guide he found in his Aunt Lucinda’s house. When Jared refuses to give the goblins the book, they drag his brother, Simon, and hold him for ransom. Jared must team up with a mythical creature, a brownie, and use The Seeing Stone to rescue his brother and kill the goblins of their house. Another mystery keeps coming to Jared’s mind. The Field Guide moves from room to room each night and sometimes during the day. Are the goblins up to their no good tricks once again, or is this a whole new mystery that Jared must one day face? Packed with enthralling chapters and turning points that will keep your mouth agape for a day, Holly Black and Tony DiTerlizzi take action and mystery to a whole new limit! The Seeing Stone is crammed with realistic scenes such as the goblins roasting the cat over the roaring fire and singing in low and rough squeals. As I read the passage, their squeals filled the air in my room and I could feel the warmth of the fire against my skin. This book is filled with chapters full of mystery and action which I would recommend to anyone, even adults! Tony DiTerlizzi has not disappointed me with his illustrations and Holly Black made me want to purchase the whole series! The Seeing Stone is a New York Times best selling book and so is the rest of the Spiderwick series! Keep up the good work H.B and T.D! Review written by Chris, Grade 6. Date of review: April 2009.